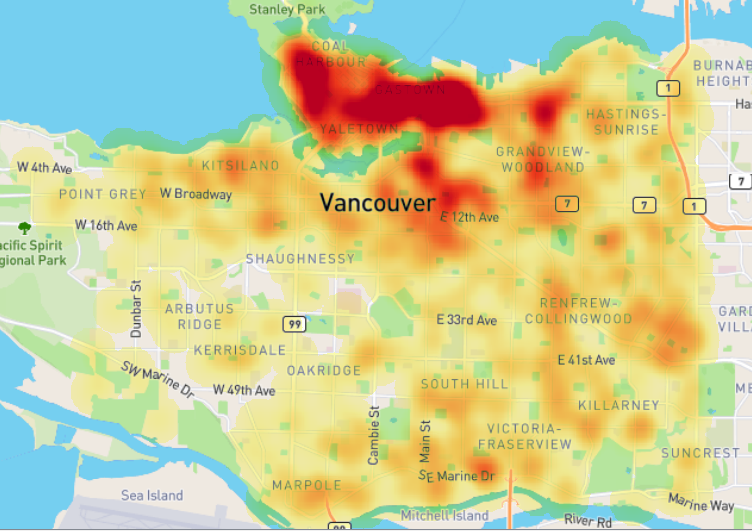 The previous post had discussed about Kernel Density Estimation (KDE) in creating a heatmap in QGIS. It explained about background and conceptual approach how KDE is applied for a heatmap production. This post will give a tutorial and example how to calculate a density value estimation around a point dataset. We will go step by step, so hopefully this tutorial could give you a clear understanding how to do a density calculation using KDE. 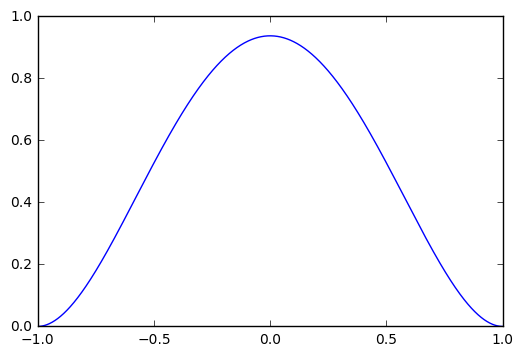 As explained before in the previous post, there are some KDE shapes which are using to construct a Probability Density Function (PDF) in order to estimate a density at a location to a reference point. In this tutorial, we will use quartic kernel shape. The quartic kernel shape has a function as in equation 1, with the shape of the kernel can be seen in figure 1. If a density value also considered a weight (W), a constant (K) and Intensity (I), then the function become as in equation 2. In this case we assume W=K=I=1. Therefore we will use equation 1 through out this example. Using the kernel, then we will calculate an estimation density value at a location from a reference point. 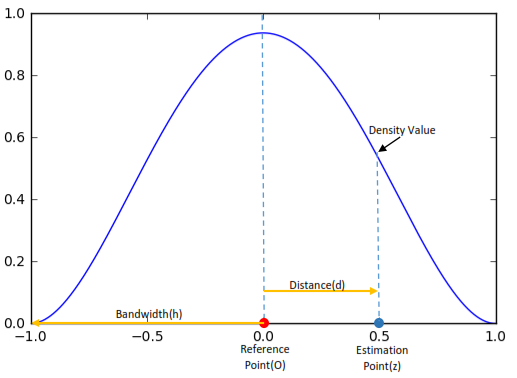 Figure 2 shows more detail about the quartic kernel shape and some properties such as bandwidth (h), reference point (O), estimation point (z) and the distance (d) from reference point to estimation point. Moreover figure 3 shows how it looks like in a space. Our goal is to find the density value at z. Knowing the distance (in this example 0.5), then we can calculate the density value using equation 1 as follow. It is quite simple, isn't it? So we can calculate a density at any point within the bandwidth radius. 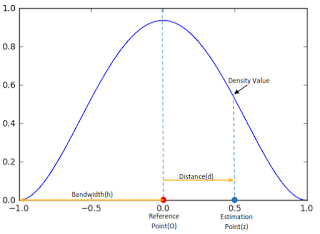 When a point reaches the bandwidth radius (equal to 1) the density value will be 0, and we do not consider any point outside the bandwidth radius. The example above shows the basic concept in estimating a density at a location from a reference point. Now let's see a more complex example. 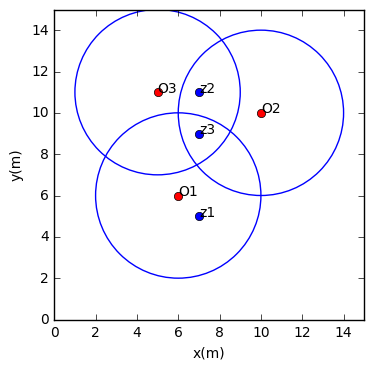 Figure 4, consist of 3 points data with coordinates O1(6,6)m, O2(10,10)m, O3(5,11)m. Next we want to compute the density estimation value at point z1(7,5)m, z2(7,11)m and z3(7,9)m. The kernel radius is 4 m.
Before we do calculation, observe that z2 is in intersection area between O2 and O3 bandwidth radius and z3 is in intersection of all reference points radius. 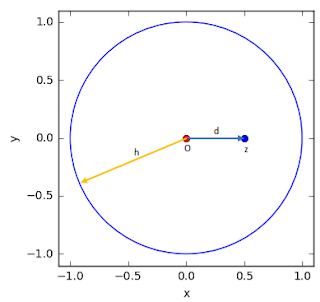 When a point lies in an intersection radius we have to sum up all density value from each reference point, then the density function becomes as in equation 3. Now, let's do the calculation. Firstly we compute the density at z1, therefore we have to compute the distance O1-z1, with equation 3.